By Tuesday, our team had fallen into a comfortable morning routine of navigating the showers, having breakfast together, and assembling our brown-bag lunches of peanut butter and/or jelly sandwiches. After receiving our assignments in the morning, we headed off in several different directions. Many in our group stayed at the Blackfeet Community College to work in the greenhouse and in the library. The Global Volunteers helping in the greenhouse learned about BCC’s use of alternative energy sources including windmills, solar panels, and diesel. The Global Volunteers in the library helped catalogue a book collection that included over 1, 000 books on Native American Indian history and culture – including one on Clint Eastwood. Other members in our group served lunch to over 150 seniors through Eagle Shield and Meals on Wheels. Later in the afternoon, many members went to the Boys and Girls Club and enjoyed spending time with over 25 local kids between the ages of seven and thirteen and helped them make beaded necklaces and other things – often to give as gifts to their mothers or grandmothers. Our day was spent at the Blackfeet Community Development Center. We went to help illustrate a series of 21 children’s books geared at financial literary. Several of our team members showed a flair for illustration and a knack for working with children, so they were great at this project. We also spent much of the day working on the children’s playground at the center. We learned this playground had been recently vandalized, and we were there to repair some of the damage and to install some new picnic tables. While we were working, several additional local volunteers arrived – all between the ages of four and nine. They taught them to stain the stools and picnic table. Hopefully, they left with a sense of accomplishment and that they helped improve their playground. We ended the day with a trip to Pauline’s, who creates herbal lotions and teas using Blackfeet traditions taught to her by great aunt. 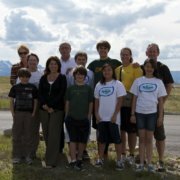 I am overwhelmed by the people I’ve met in Browning – both those on the Global Volunteer team and the local Blackfeet. Our team leader has emphasized that our trip is more about relationship building than about the projects we’re working on. Today I learned how true that is. I can’t believe it’s only Tuesday.